One of the questions that has routinely arisen since Michael Brown was killed is, “Where are the leaders?” Folks near and far questioned the “validity” of the movement because they didn’t see any “leaders.” Cable news pundits, celebrities and commoners alike spouted skepticism about the viability of this movement for racial justice because they didn’t see any leaders or perceive any leadership. Sometimes it’s hard to see what you’re not looking for. There were no optics of a single person leading the masses toward the “promised land.” No one person could be heralded as being in charge of the protests, and there was no spokesperson for the movement. What emerged from the ground up was an eclectic group of people, many of them young, and most of them black women. The leaders of this new school of thought were too often unrecognizable because many in our society rarely conceive of them as leaders. In this chapter, women leaders give voice to the ways in which leadership emerged in this movement and the centrality of the role of women. Karen Anderson, the pastor of Ward Chapel AME Church in Florissant, Missouri, makes a case for how she sees the distinctiveness of women’s leadership in this movement and sees parallels to the overlooking of women’s leadership in the church. “At this time in history there’s a strong need for a woman’s voice. There’s strength in a woman’s voice but it’s tinged with compassion and understanding and a desire to move to a place of resolution. I think women aren’t so entrenched in being right. I think we’re more entrenched in ending with a right outcome. We don’t have to be right. But we want the right outcome. And we’re very clear about what the outcome is. “I think there’s a need for a woman’s voice because of the lens that we look through. We even interpret scripture differently, and I think that, many times, women see the people whose voices we don’t hear in scripture as clearly and so we don’t preach the text like everybody else preaches it. For decades, black womanist and feminist scholars have rendered critical critique of the role of black women in the church and society, and called attention to the need to dismantle sexist and racist practices that too often render black women second-class citizens. In her book titled “If It Wasn’t for the Women,” sociologist Dr. Cheryl Townsend Gilkes explores the multiple roles of black women in the church, family, and community; and the ways in which their contributions have been indispensible to the well-being and sustainability of families and communities. Gilkes brought to the forefront the role of women as the “backbone” of churches and communities, yet often undervalued by patriarchal systems that denied them official leadership roles, so that they were left to find creative ways to make their voices heard. Ethicist Keri Day issues the challenge for black churches to not only celebrate the “backbone” sacrifices of African American women, but to acknowledge the need for the church to stand in solidarity with poor black women and help dismantle the social injustices that threaten their economic stability. … Even though the #blacklivesmatter ideal was presented before Michael Brown was killed, many of the respondents to his killing quickly grabbed hold of the #blacklivesmatter slogan because it embodied the essence of what they were responding to. For many, they were responding to the fact that an 18-year-old, unarmed, young black man was killed in the middle of the day, in the middle of a main apartment thoroughfare, and his body lay in the street for over four hours. It was the ultimate expression of disregard for black life, so the gravitation to the #blacklivesmatter slogan was an appropriate fit. The women who launched the #blacklivesmatter initiative, as well as the women who have provided leadership during the movement for racial justice in Ferguson, are all emblematic of the ways in which leadership is taking shape in today’s world. The “one size fits all” and “top down” approach does not resonate with the young activists of today, and it is incumbent upon the rest of us to look more closely at how they are providing leadership in creative and innovative ways. Brittany Ferrell, one of the founders of Millennial Activists United, offers a candid description of how she understands leadership to have emerged in this movement. “When people think leader, they think it should be one singular individual who’s charismatic enough to galvanize the nation. But what they have now is a charismatic group of individuals all over the nation who partake in group-centered leadership because, when one person has to attend to their life as it goes on within the movement or as one person makes mistakes or as one person goes through the ups and downs of life, the movement continues, it carries on. “It’s all a part of the love and support that’s engrained in the movement. With group-centered leadership, why, you’re able to support one another because we all have the same goal in mind. We’re working at different paces and we’re all working on. It’s like this big clock. And each group or each individual is working on an important piece to contribute to making those hands turn; those hands are black life. Those hands are black freedom and black liberation. Those are those hands, and we’ve got to get those hands to turn, right? But for those hands to turn, we’ve got to have people advocating for all black lives, gay, straight, whatever. “We have to have people advocating for equality in education. We’ve got to have people who are trying to end this ‘cradle to prison’ pipeline. We’ve got to have people who are going to challenge this prison industrial complex. We have to have people who are going to advocate for equal healthcare for poor people -- poor, black people. “It’s many different gears that we have to work on to get this -- these hands of this clock to move. And each gear is working. Each gear is working. It’s not worried about the next gear. It’s working on what it’s got to do to work. It’s doing its work. This one’s doing its work. “So if one of those gears says, ‘I’m getting a promotion. I’m out of here,’ right -- people want to get into politics now because they are done building their platform. People want to move out of the city that they were fighting in because they got a greater following, and they got a better opportunity somewhere else. If one of those gears up and leaves, what’s going to happen? Those clocks -- the hands on that clock are never going to move. So that is group-centered leadership. That’s how you make it work for a community. You have an understanding that you’re working together. It’s not about, ‘Hey, I’m on this pedestal,’ ‘I’m the next MLK,’ because what you saw was not MLK. What you did not see was Ella Baker. What you saw was not Malcolm X. What you did not see is: who was holding [Malcolm X’s] head when he was shot and killed? A woman, an Asian woman. Dietra Wise Baker is the pastor of Liberation Christian Church in St. Louis. She picks up the theme of comparison to the Civil Rights Movement and an additional perspective of the ways clergy have emerged as leaders in this movement. 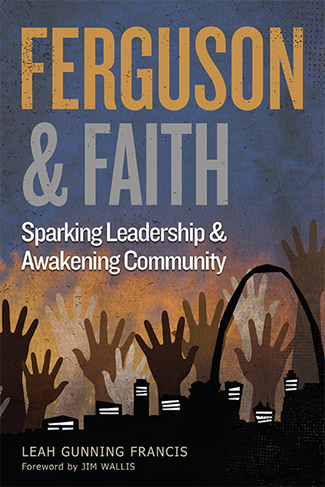 Excerpted from “Ferguson and Faith: Sparking Leadership and Awakening Community” by Leah Gunning Francis, published by Chalice Press. Copyright 2015 © by Leah Gunning Francis. Used by permission. All rights reserved.